The state of Guinness in America has always surprised me a bit. In a nation of fizzy, yellow, and generally flavorless beer many bars have on tap this black as night, creamy, and semi-flavorful beer. Something I’m quite glad about. 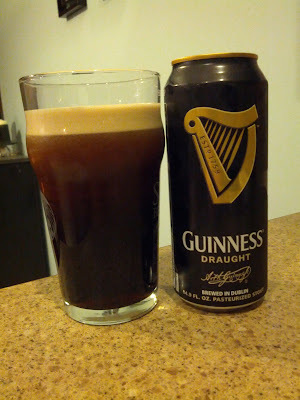 I’m no Guinness-fanatic, even though I’m mostly Irish, but I do prefer it over the fizzy yellow stuff. If you’ve never had a Guinness can or bottle, or if you’ve had and pondered what that clinky sound is, allow me to educate you on the widget. Nitrogen is a way of dispensing beer and is what helps make Guinness on tap so nice and creamy. To achieve that in a can/bottle they decided to create a “widget” basically a little nitrogen container that releases it’s nitrogen when you crack open the beer. Next time you open one of these listen closely and you’ll hear it go off. Widget or not I’m ready to drink. While pouring there is a blend of brown and black swirling around. Once pouring is complete it settles into a pitch black color with a light brown/tan head that appears super thick and shows no signs of going anywhere. I think appearance has always been one of Guinness’ strong suits. Decent roasted malt aroma with some coffee in the background. Not much else going on beyond that. The flavor is… interesting. Very slight roasted malt flavor with minimal malt bitterness, I stress very minimal bitterness. I get a bit of coffee and maybe some tiny bit of chocolate way in the back. Overall there isn’t much happening here. Extremely light body that is very creamy. Creamy… but somehow feels more like water than beer, it’s just way too light. It’s been a good long while since I had a Guinness and either my memories are skewed or this beer has changed. This tastes much more watery and no where near as flavorful as I remember. I’m thinking that Guinness may have changed the formula to appeal to the mass market a bit more. Making it lighter in flavor and body, the less there is the less there is to object to, thus the more people will drink it. Hopefully the Guinness Extra Stout I got will be better.